After first hitting the market last September, Jessica Chastain’s lovely Greenwich Village duplex has finally found a buyer according to city records. The actress bought the renovated two-bedroom at 250 Mercer Street in 2012 for $1.2 million and initially listed it as an $11,500/month rental before re-listing it for sale for $1.8 million in April. The buyer paid slightly over ask at $1.9 million. 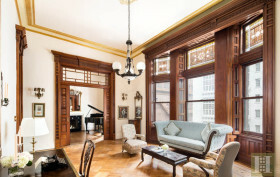 Jessica Chastain put her former digs at 250 Mercer Street on the rental market for $11,500 a month back in September. But it looks like now she’s trying to unload the Greenwich Village duplex for good, as the Observer reports that the apartment has been re-listed for sale at $1.8 million. Chastain bought the 1,284-square-foot home in 2012 for $1.2 million, so she’s not turning that much of a profit, but considering she bought a $5.1 million residence at the historic Osborne last year (that once belonged to Leonard Bernstein), we’d say this isn’t much of an issue. Jessica Chastain, who has been on a house hunt for over a year, has finally found the home of her dreams. The Post reports that the Oscar-nominated actress will be joining the world’s upper crust at the landmarked Osborne at 205 West 57th Street. Chastain is said to have paid $5.1M for the home which itself also boasts a legendary story, being once owned by famed composer and conductor Leonard Bernstein for more than a decade—a highlight that was apparently one of the biggest draws for the Juilliard-trained actress.